Machu Picchu’s peculiar emplacement, high in the emerald green Andes, is characterized by a mystical cloud forest environment. This type of ecosystem is the habitat of unique species of flora and fauna, some of them threatened with extinction. The invaluable archaeological heritage of the Historic Sanctuary of Machu Picchu combines magnificently with the splendid natural surroundings. Arrive to Machu Picchu by the Sun Gate. Real-time Inca Trail permit information. We pick you up from your Cusco hotel. FREE luggage storage while hiking. The adventure begins today in Cusco, Peru. Before leaving the hotel, make sure you are carrying your original passport and for those with a discount, a valid Student ID card is necessary. Travelers are collected at around 6:00 am. from their hotels and start a spectacular scenic drive through the mythical Sacred Valley of the Incas with beautiful views of the Urubamba river, picturesque Andean villages and the Inca fortress of Ollantaytambo. Along the way we might stop at Urubamba or Ollantaytambo for last minute supplies, leg-stretching or to use the restrooms, before continuing to Piscacucho. In Piscacucho, kilometer eighty two, you will get acquainted with the rest of the crew and the porters who will be carrying the camping equipment. 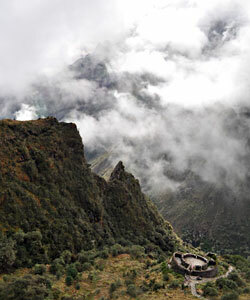 This point is where our hiking trail begins, it is also the location of the first official Inca Trail check point. After clearing the gates and crossing a suspension footbridge across the Urubamba river, the trek begins with a gentle climb. Following the course of the river, the first three hours are on relatively flat terrain. Superb views of the snow-capped peak of Wakay Willka known as Veronica can be observed as well as the Urubamba mountain range which divides the jungle and the Andes. You are now approaching the Inca fortress of Willka Raccay. After lunch, you will continue hiking towards the extensive Inca settlement of Llactapata (Patallacta on some maps) and appreciate the impressive farming terraces of this complex. The Inca Trail follows the left bank of the river up to the village of Wayllabamba at 9840 feet above sea level (3000 masl) where you will enjoy dinner and camp for the night. :: Buenas noches amigos! Early wake up call, with hot tea brought to your tent, in order to prepare for today’s trek which is considered by many, the hardest. You need to complete a steep ascent reaching an altitude of 13779 feet above sea level (4200 masl) at Warmi Wañuska pass. After breakfast, depart from the campsite at around 07:00 hrs. The uphill hike through Llulluchapampa will give you the opportunity to appreciate several species of birds (with luck you may see falcons, hummingbirds or black-chested eagles). From here the trail traverses a beautiful cloud forest full of Polylepis or Queñua trees before entering the puna, a zone characterized by treeless grasslands only found at this altitude across the Andes. Walk at your own pace, stop as many times as you like, to catch your breath or to stretch a muscle. The last hard climb takes us right to the highest pass of the inca trail at Warmi Wañuska. Once at the top you will be rewarded with spectacular views of the Andes, the Huananay massif and the surrounding snow-covered peaks. You will also feel a great sense of accomplishment after conquering Dead Woman’s pass. Remember to have a warm jacket and your beanie at hand when reaching this altitude as temperatures may drop drastically. After a deserved rest, continue traversing the slopes on the left side of the valley all the way to our campsite in Paqaymayu at 11811 feet above sea level (3600 masl). You will find toilet facilities here. Possibly the longest day of inca trail hiking but one that will bring splendid landscapes and vistas. A perfectly scheduled cup of hot tea will follow the wake up call at around 06:00 hrs. Enjoy breakfast with your trekking comrades and prepare yourself to hike along well preserved Inca pathway, for the most part, being original. Start with a steady ascent to the second highest pass at Runkuracay reaching 12400 feet above sea level (3780 masl) and passing through a circular inca control point that occupies a commanding position overlooking the spectacular Vilcabamba mountain range below. Catch your breath and realize the rest of inca trail is mostly downhill. Be careful with your knees as the descent from the pass to the ruins of Sayacmarca is very steep and you may feel the strain at the end of the day. It is recommended the use of trekking poles, additional gel insoles and perhaps an additional porter. Take a pause at this archeological complex located at 11472 feet above sea level (3497 masl) for an in depth tour and explanation. The name Sayacmarca means “inaccessible town” and clearly describes the position of the site, perfectly perched on the edgy rocks. The one of a kind Inca trail, now a monumental structure of granite stones, continues through ever-changing layers of cloud forest full of rare orchids, hanging mosses, bromeliads and tree ferns. Past the inca tunnel, a gentle climb will take you to the third pass at 12139 feet above sea level (3700 masl), offering incredible views of several snow capped peaks including Salkantay (20574 ft./6271m) and Veronica (18865 ft./5750m). Close to the pass you will find the impressive ruins of Phuyupatamarca (cloud-level town). A brief explanation of the mysteries of Inca architecture, before continuing along splendid paved Inca road to the impressive agricultural site of Intipata and up to the third and last campsite at Wiñayhuayna (forever young) located at 8856 feet above sea level (2700 masl). Today begins earlier than normal, after breakfast we say a farewell to the porters and set off on the trail by 04:00 hrs in order to get to Machu Picchu. This last part of the trail from Wiñayhuayna to Machu Picchu takes about one hour and a half of hiking and is clearly marked, but you will be walking in darkness. It is highly recommended to bring a head lamp. The path is narrow, traverses a lush cloud forest of giant ferns and brings an almost vertical ascent of about 50 steps to Intipunku, the gate of the sun at 8920 feet above sea level (2719 masl). Suddenly all efforts up until this point are rewarded with an unforgettable sight. A backdrop of natural beauty, human art and forested peaks framing the magical city of Machu Picchu. You will have plenty of time to take photos of the Lost city of the Incas, from the classic postcard view and different angles around.A final short hike will bring us to the entrance and into the heart of Machu Picchu itself, where we spend the rest of the morning with a 2 hours guided tour and some more exploring on your own. The shuttle bus ticket from Machu Picchu to Aguas Calientes is included, departs every 15 minutes and will be available for you to descend whenever you decide it is time to go, just double check your train schedule and be at the train station one hour before departure. The train ticket included departs at 18:20 hrs. arriving to Ollantaytambo at approximately 20:05 hrs. It is recommended to upgrade your train to Vistadome-Poroy service giving you an earlier departure time and superior seat comfort for the ride back to Cusco. Whichever train station you arrive (Ollantaytambo or Poroy) transfer from this location to Cusco will be provided. You will arrive to Cusco at around 22:30 hrs. with the included service. Important note: Campsite allocations are subject to change depending on availability provided by the National Institute of Culture (government office in charge of the Inca Trail). * Valid Student ID card required. + view detailsPlease send us a digital copy of your student id card immediately after booking. Without this document we will not be able to apply the discount (a clear digital photo of the card will suffice). Recent Government policy for getting this discount includes: Student must be under 26 years old, student card expiration date must be no later than one year after the start of your trek, it does not have to be linked to a credit card (e.g. showing Visa, MasterCard, etc. ), Graduated student Cards and ISIC cards are not valid. Only Student ID cards with these features are acceptable. Bring your student card with you on the Inca Trail as it will be checked several times by government officials. Unfortunately no other forms of student identity are acceptable. * Prices are valid for 2018 & 2019 trekking season. Important: 2018 Inca Trail Trekking season starts March 1st, 2018 and ends January 31st, 2019. Additional portering service : USD 75.00 (per load) + view detailsIf you are considering bringing some photography equipment or other heavy accessories, or just simply don’t want to carry anything, please request additional portering service to carry your personal belongings (i.e. sleeping bag, foamy pad), this way you will freely enjoy the hike. (This is highly recommended if you have never hiked over 10000 feet). Cooks handle all the kitchen chores. Working conditions of our porters is a very important issue for us, that is why we enforce inca trail regulations. Request Additional Porter when filling the Booking form. Porters require a permit and they won’t be available if permits are sold out. Each porter is allowed to carry up to 20 kg (44 lb). If you request additional portering service, the additional porter is allowed to carry up to 15 kg (33 lb) of your belongings, the remaining 5 kg (12.5 lb) will be for the porter’s personal belongings. 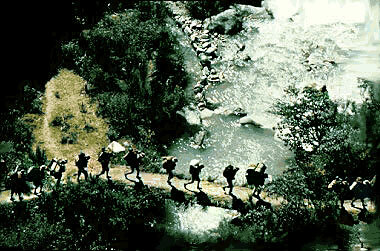 Support inca trail porters as they do the hardest job. We will need a digital copy of your student id card. Please email a scanned copy or digital photo to: info at incatrailreservations.com -$46 ea. We need to obtain a permit for the porter along with yours. Please request now if you will need this service. It is highly recommended if you haven’t hiked above 10000 feet. 1 load = 7.5kg (16.5 lb). $75 ea. We have sleeping bags available in our office at the Cusco location. We rent them for the entire duration of the trek. $25 ea. Due to the conditions of the terrain you will be hiking on, walking poles are recommended. $20 ea. Normally tents are for two people, request here if you need a single tent. $25 ea. Your return train ticket will be upgraded to Vistadome service arriving to Poroy train station. This will give you a more pleasant and full of views back ride to Cusco. $70 ea. The high peak next to Machu Picchu is called Huayna Picchu. A special ticket is needed to hike to the top. Request this now due to limited availability per day. $85 ea. 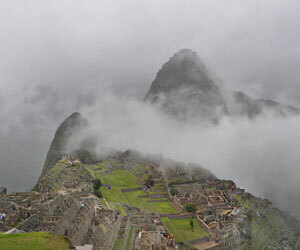 Staying overnight by Machu Picchu is possible the last day of the trek. If you decide for this option your train ticket will be issued for the next day with no extra charge. 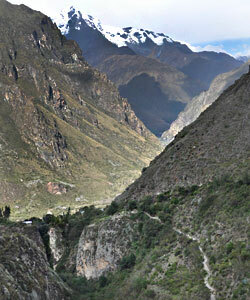 Permits for the Inca Trail are included in the package. Confirm your space on the trek by booking now.